Nereid or Neptune II, is a moon of Neptune. Nereid was found on 1 May 1949 by Gerard Kuiper, who suggested the name in the report of his discovery. It is named after the Nereids, sea-nymphs of Greek mythology. It was the farthest of Neptune's known moons for a long time (Halimede through Neso have since taken that honour), and is the third biggest, with a diameter of 340 km. Its orbit averages 5,513,400 km in radius, but is very eccentric and varies from 1,353,600 to 9,623,700 kilometres. For a long time this was the most highly eccentric orbit of any known moon in the solar system, but Bestla, a more recently discovered moon of Saturn has a more eccentric orbit. The unusual orbit suggests that it may be a captured asteroid or Kuiper belt object, or possibly that it was perturbed during the capture of Neptune's largest moon Triton. Very little else is known of Nereid. 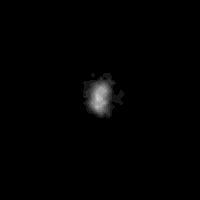 Nereid was too far to be properly imaged by the Voyager 2 probe when it visited the Neptune system in 1989. Photos sent back show only its very non-spherical shape, and no surface features could be seen at the resolution available. This page was last changed on 17 August 2018, at 02:45.